A wind from the north blew steadily. I opened the tube, removed the kite, and put it together. In an instant, the kite caught me off-guard. It leapt from my hand, tugging and pulling until it wrestled free. As I stood there holding the line and watching the kite soar upwards, a totally unanticipated euphoria overcame me. I was elated and puzzled. I felt in balance, simultaneously grounded and elevated. Enthralled with what I had thought was merely a child’s toy, I lost all track of time and flew the kite till sunset. I pedaled home that evening, feeling weightless, harmoniously sandwiched between yin and yang, knowing there was more to kite flying than met the casual eye. 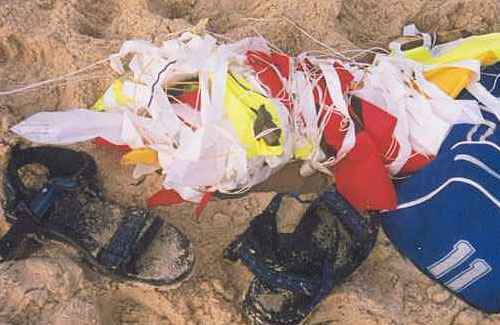 On July 26th, Hanan went and flew a kite on the beach of Ashdod. On the kite he'd written "Death does not justify Death" in both Hebrew, and Arabic. I guess he had read Uncle Bill's Helicopter. I imagine he launched that kite with hope in his heart, and the same sense of elation he described to me the previous day. What happened next? Two individuals took the kite down and destroyed it - and he was beaten up. Here's his story about the violence at the beach. But: Pain shared is reduced, Joy shared is increased. The same day you wrote me, here on the other side of the world, connected by this amazing thing called the Internet - I parked at a beach near Santa Cruz, and watched the kite-sailers surfing the waves, and meditated on your first letter. Watching them, I felt the same simple joy and freedom you felt on the 25th. Daedalus and Icarus made a legendary flight, but Icarus flew too close to the sun and crashed. You and I and Icarus have flown too close to the sun, but we still live, we still try. I'll fly a helicopter, thinking of you. Others will fly kites. Still others will come up with something else to do. More people have now seen your kite fly on the web than did at the beach. Your dreams will fly again. Rest up.